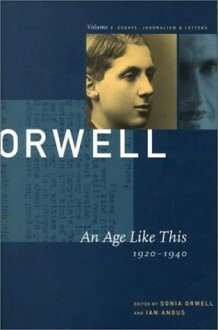 Considering that much of his life was spent in poverty and ill health, it is something of a miracle that in only forty-six years George Orwell managed to publish ten books and two collections of essays. Here, in four fat volumes, is the best selection of his non-fiction available, a trove of letters, essays, reviews, and journalism that is breathtaking in its scope and eclectic passions. Orwell had something to say about just about everyone and everything. His letters to such luminaries as Julian Symons, Anthony Powell, Arthur Koestler, and Cyril Connolly are poignant and personal. His essays, covering everything from "English Cooking" to "Literature and Totalitarianism," are memorable, and his books reviews (Hitler's Mein Kampf, Mumford's Herman Melville, Miller's Black Spring, Goldsmith's The Vicar of Wakefield to name just a few) are among the most lucid and intelligent ever written. From 1943 to l945, he wrote a regular column for the Tribune, a left wing weekly, entitled "As I Please." His observations about life in Britain during the war embraced everything from anti-American sentiment to the history of domestic appliances.